This red blend from France’s (Southern) Languedoc region is an excellent wine and it was only $9.99 at my Costco store. 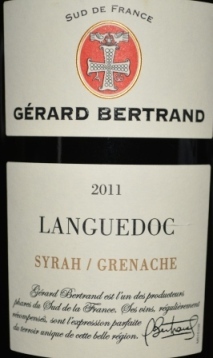 It is a blend of Syrah and Grenache, two varietals that both thrive in the southern parts of France. The wine is drinking at a perfect point right now, having spent a little time developing its full character, which really comes through. The nose is super fresh, floral and spicy; really started to leap out of the glass after a few hours. It is medium to full in body with vibrant red and dark fruit flavor, a little plum, leather, a touch of sweetness, and some white pepper, leading into a sticky, dry finish. A nice food wine, and a strong value for $10. I don’t think you can wrong with this wine. We will be adding it to our Top Picks list given its extreme value.